CPA-1 & 2 is high performance PC/HDTV test pattern generator with over 20 most-often-used test patterns that can be used as an industrial standard signal source for testing, broadcasting and troubleshooting. It is ideal for use with LCD, PDP, CRT monitors or projectors that equipped with VGA or DVI input. Two models available. VGA or DVI. 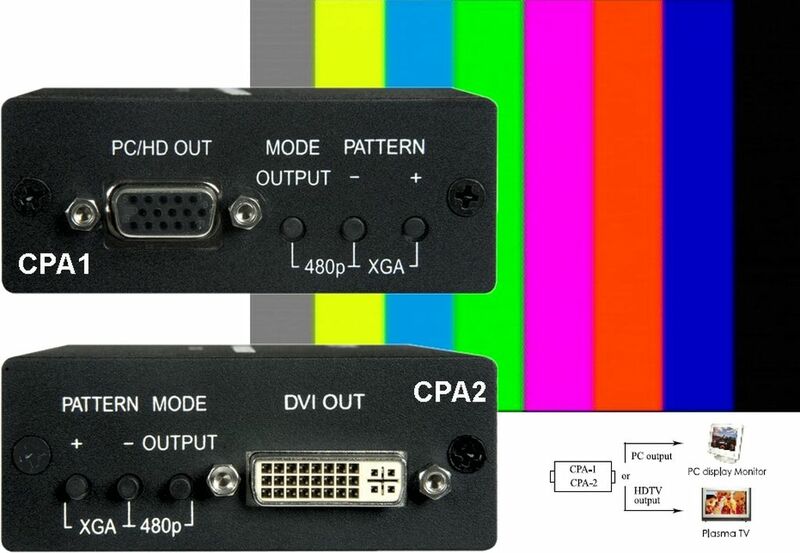 The output format is analog RGBHV/YPbPr via HD-15 VGA (CPA1). The output format is digital RGB data bitstream via 24-pin DVI (CPA2). Provides a wide range of PC/HDTV output resolutions. 1024x768 or 720p. Generates 27 test patterns including most useful test patterns in Video/PC industry, such as Color bar, Multiburst, Circle, Crosshatch..... OSD indicates output resolution and refresh rate up to 85Hz. Compact size, sturdy metal case. Easy to operate push buttons.